Discussion in 'History & Past Politicians' started by upside-down cake, Jan 13, 2019. Is it me or do we have the wrong opinion of what cultures were in history? For instance, we always tend to think of Europeans as Europeans- a generic block of culture that's roughly the same. Or we tend to think of Africa as a generic block of culture. But take Egypt and Rome. Egypt is on the African continent and Rome is on the European continent. However Egypt and Rome probably have far more in common with each other than Rome would Britain or Egypt would Mali. I would actually classify Rome and Egypt as Mediterranean cultures. That does not mean they are the same. There are obvious distinctions, but they share more cultural nodes and history that is distorted by the geo-political labels given to them. Not only that...but we tend to think of European culture as being based around western Europe, but history shows that western European culture was shaped more by the Mediterranean cultures- mostly Rome, Carthage, and the Islamic conquerors of the time. Consider that many of the most common names of western Europe- David, John, Michael, Adam...- they are Semetic in nature. The main religion of Europe is Semetic in nature. Europe claims ideological ancestry from the Greeks and the Egyptians. We derive or political templates from the Romans and the Venetians. Today, the dominance of western Europe has realigned perception of the identity of Europe with the northwest, but it's actually a Mediterranean hybrid that leans toward the Med and away from it's historical tradition- a pattern that is witnessed repetitively in many conquered societies. Interesting can of worms you've opened there, but I'll start by agreeing with you that we do have a tendency to mischaracterize cultures, largely because we aren't fully aware of their complex history and development. Relevant to this subject, I'm currently finishing a book called Inventing the Individual: The Origins of Western Liberalism by Larry Siedentop, which explores the evolution of Western European (and American) thought, law and culture from Ancient Greece to Modernity, and in it he describes how much of that evolution was driven by Christianity and its institutions (the Catholic Church, etc.). Given how Christianity was arguably the sole unifying element in Western Europe, it's not difficult to see how Christian institutions, philosophy, canon law & lawyers, etc., building on their Jewish and Classical Greek and Roman predecessors, would shape Western thought and culture. After laying the ideological foundations of the Age of Reason and Enlightenment, the rulers and philosophers of those periods would build on those Jewish, Classical and Christian foundations and further develop what we recognize today as Western thought and culture. Of course, I'm only talking about part of what qualifies as European thought and culture. What about Eastern European thought and culture? We could also further subdivide European culture into Southern (Mediterranean) European culture and Northern European culture, all of which have their own unique attributes. When we start doing this it obviously becomes increasingly difficult to define what European culture is. Clearly, I'm drawing a very incomplete and imprecise picture of European thought and culture here, but again I think it speaks to your points about the difficulties we face when we try to simplify something that defies simplification. It is interesting to consider the question: what is western/European culture? Certainly its dominance originated in the mediterranean But ultimately i think the “European” term has more reference to a cluster of “modern” influences that emerged and flourished in western europe: the renaissance, capitalism, the magna carte, the scientific method, universities, free speech, banking, publishing, medicine, and yes,christianity. Interesting bit of phrasing with Islam being singled out as conquerors even though the two other cultures were far more violent. I agree. Most of Europe's culture was a result of the Roman Empire which borrowed from the Greeks. The Roman Empire was a Mediterranean culture as was Greece. Egypt far exceeded the Romans with their dynasties in pre-Roman times. After Alexander the Great, Egypt lost a lot of it influence although the Ptolemies were still a force to be reckon with. You could say Rome civilized Europe with its conquest of France, Gaul as they called it, Spain and Britain. Although a lot happened after the Roman Empire fell. But yes, I would say the European Culture of today grew out of the Mediterranean Culture of 2,000 years ago. You're also correct that the African countries around the Mediterranean today more resemble the old Romans than the rest of Africa in people and culture. Then Europe took that culture to the America's. It's safe to say the Americas have or are based on European culture which was based on the Romans and the Greeks. Asia has its own culture, so in a way with differences between Chinese, Indians, India type, one could say there are basically two cultures left in the world. European and Asian. The Polynesians probably would classify as a minor culture or sub culture off of the Asian culture. Something like that anyway. The ancient Siberian contribution to Northern Europe cannot be ignored. The frequencies of Haplogroup N generally correspond with Finnish ancestry in Scandinavia (7% in Sweden; 2.5% in Norway.) The carriers of Haplogroup N originally arrived from Siveria 4,000 years ago. 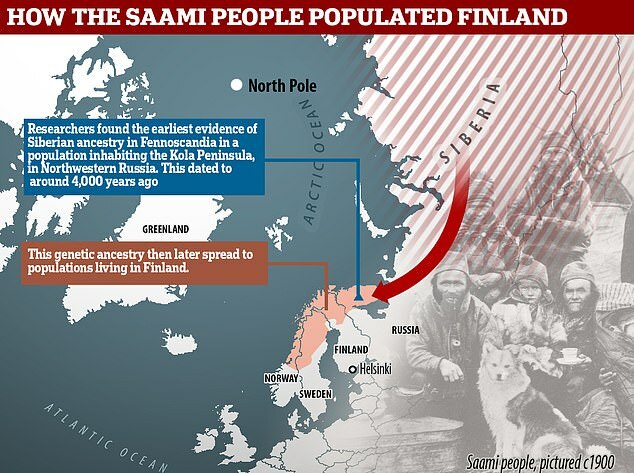 The study found that people genetically similar to present-day Saami people inhabited areas in much more southern parts of Finland than the Saami today. European population history has been shaped by migrations of people, and their subsequent admixture. Recently, ancient DNA has brought new insights into European migration events linked to the advent of agriculture, and possibly to the spread of Indo-European languages. However, little is known about the ancient population history of north-eastern Europe, in particular about populations speaking Uralic languages, such as Finns and Saami. Here we analyse ancient genomic data from 11 individuals from Finland and north-western Russia. We show that the genetic makeup of northern Europe was shaped by migrations from Siberia that began at least 3500 years ago. This Siberian ancestry was subsequently admixed into many modern populations in the region, particularly into populations speaking Uralic languages today. Additionally, we show that ancestors of modern Saami inhabited a larger territory during the Iron Age, which adds to the historical and linguistic information about the population history of Finland. We generally have the wrong opinion of what other cultures are today! Historical ones have no chance. Everything we know about any “distant” topic will be based on limited information, with that information influenced by so much bias, ulterior motive and incompetence even before it interacts with our personal bias, ulterior motives and incompetence. The result is always going to be messy. The best we can do is be conscious of the limitations and flaws in our understanding and perceptions. There are a great many cultures throughout Asia, and in America. There is a wide variety and disparate plethora of cultures all over the world. Not just two. Most I would classify as sub cultures to the main two. Others see it differently. The main two are the bottom trunk of the tree with all the growth and limbs evolving. Another way of looking at is Rome took a bunch of different cultures and united them into a Roman culture which after the fall of Rome began dividing again. Rome is still a bench mark either way. Most I would classify as sub cultures to the main two. Others see it differently. y. The great majority of others. You’re just playing.